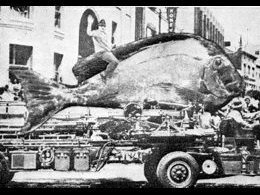 This photo accompanied an article that ran on the site lightlybraisedturnip.com in January 2014, claiming that a giant squid (grown to mutant size because of Fukushima radiation) had washed ashore near Santa Monica. The article was intended as satire. Nevertheless, the image soon began to circulate online. 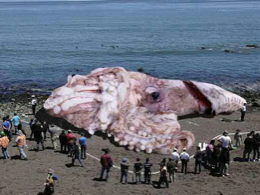 The image was a composite of a squid washed ashore in Spain and a beach scene in Chile. A photographer happened to take this series of photos just as a shark was leaping from the water behind a surfer. 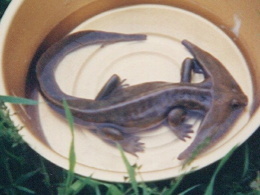 The mysterious creature in the bucket was actually a clay model, not a surviving prehistoric Diplocaulus. 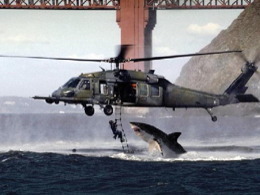 Despite what this photo shows, a Great White shark has never attacked a helicopter in San Francisco Bay. This award-winning photo was taken at the Alaska Department of Fish & Game aquarium in Anchorage. It was not photoshopped! 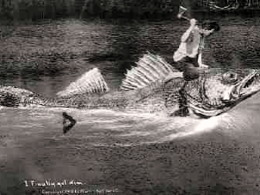 The Honolulu Star-Bulletin ran this picture on its front page on Apr 1, 1939, accompanied by a report claiming that Norwegian scientist Dr. Thorkel Gellison (an "authority on prevaricana") had caught the largest fish ever recorded while on holiday in Hawaii. 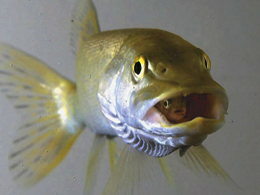 The fish was said to be of the species Gellisoni Fabricata. The doctor caught it "with ordinary Mason & Dixon line, with a leader of Associated Press wire." 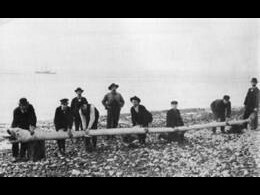 A group of men show off a sea serpent that washed up on the beach at Ballard, Washington. However, the "sea serpent" looks suspiciously like the trunk of a tree.